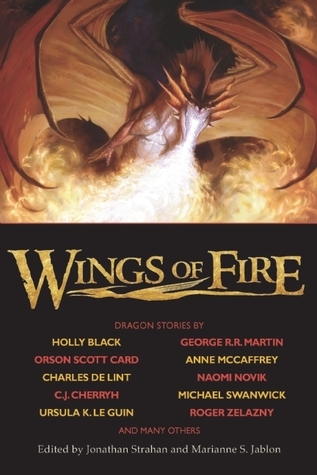 Wings of Fire brings you all these dragons, and more, seen clearly through the eyes of many of today’s most popular authors, including Peter Beagle, Holly Black, Orson Scott Card, Charles De Lint, Diana Wynne Jones, Mercedes Lackey, Ursula K Le Guin, Dean R Koontz, George R. R. Martin, Anne McCaffrey, Elizabeth Moon, Garth Nix, and many others. I’ve been working my way through a Romance anthology, Hot Alpha SEALs, and I was starting to get burned out. Too many “meh” novellas in a row. I decided to try to mix it up a bit and start on a different (Fantasy/Sci-Fi) anthology: Wings of Fire. I’ve had this book on hold for quite some time now so this is a good time to start. I have pretty decent hopes for the entire anthology – this is the second anthology I’ve bought that has been edited by Jonathan Straham (the first was Swords & Dark Magic: The New Sword and Sorcery with Lou Anders). The first story in Wings of Fire that I’ve read is “Stable of Dragons” by Peter S. Beagle (The Last Unicorn). “Stable of Dragons” is a poem. A very interesting and yet exceedingly odd poem. Only a few pages long with slightly unusual formatting, “Stable of Dragons” tells of a man who owns a barn full of dragons. There’s a twist to the poem that I don’t want to spoil but it totally surprised me and thus required a higher rating than the 3-3.5 stars I had originally planned to give.